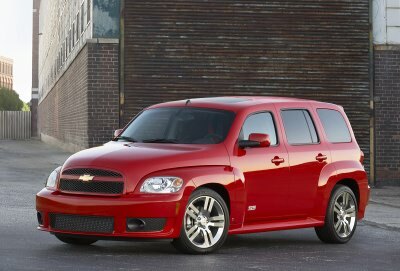 Chevrolet introduced the HHR a while back in a move I've always assumed was aimed squarely at Chrysler's popular PT Cruiser. It’s a modern small wagon that not only lets you haul your family and its stuff, but which has a healthy dash of style (though it’s retro style: GM says HHR hearkens back to the 1949 Chevy Suburban) thrown in for good measure. 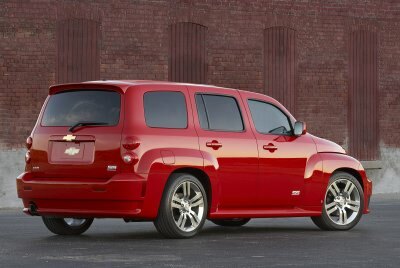 Chevy presented me with an outrageous “Victory Red” HHR SS, which I expected to be a fairly bland and uninteresting drive. After all, it’s a little van – how much fun can it be? But I was very wrong and ended up bonding quickly with the SS and had a blast playing with it for a week. I doubt I would've found the HHR sans SS upgrades as much fun, but you never know. For 2008, the HHR has been given stuff like StabiliTrak electronic stability control, OnStar and a tire pressure monitoring system. You can also get it with solid rear quarter panels (making it even more van-like, especially if you eschew the rear seat), though I imagine that could take a vehicle that's already a tad greenhouse-challenged and make it even more claustrophobic. Not that it's cramped in there. In fact, headroom is very generous (I felt almost as if I could stand inside it) and we never felt crowded. The SS version also features a high performance suspension, "ground effects" and unique fascia front and rear, SS badging, and a liftgate-mounted spoiler. Rounding out the package are 18-inch high-polished forged-aluminum wheels wearing a set ofP225/45 R18 Michelins. My sample came with the optional limited slip differential as well. Propelling the front wheel drive HHR SS is a turbocharged two liter four cylinder engine with variable valve timing, a power plant that rumbles nicely and whose 260 horses (and identical torque) prance along with wild abandon. That's 111 more horses than the base 2.2-liter four banger and 88 more than the non-SS HHR's optional 2.4-liter four. Needless to say, the vehicle’s “get up and go” is laudable, and the extra horses don't demand as many extra oats as you might imagine. I didn't actually calculate my gas mileage, but Chevy says the SS gets an EPA-estimated 29 mpg on the highway and, from the amount I spent at the pump, I believe it. There's turbo lag and torque steer, but neither is particularly obtrusive. HHR’s "slow down and stop" is accomplished via four wheel disc brakes with ABS, with good pedal feel and stopping performance. Less well-equipped HHR's have rear drum brakes with optional ABS. A Getrag five-speed manual transmission is standard and it’s pleasant to use, though a tad rubbery. And though it was nice being able to row through the gears, a five speed stick seems a little out of date in a supposedly performance vehicle such as this. Inside, the HHR is comfortable and sporty and pleasant. My test unit featured an optional performance driver's seat that was power adjustable and held me in very nicely. The standard SS equipment includes a premium cloth driver's seat with SS embroidery, "Ultralux" inserts and color-keyed accents. The front passenger seat, which folds flat for hauling long things, is also comfortable and supportive, though it adjusts manually. The rear seat's quite good for two, a little cramped for three, and it splits 60/40 and folds flat. I had a major problem with the instrument panel. The scale on the speedometer is too small (or the speedometer's too close) for me to comprehend without putting on my reading glasses. I had the same problem when I drove the Mini Cooper, and spent my week behind the wheel of both vehicles thinking of ways to explain why I was driving faster than the powers that be think prudent. Other than that, I liked the HHR's interior, which is well laid out and puts all the controls you need closely at hand. There's plenty of storage space, too, including a little dash-mounted bin that's perfect for holding your sunglasses, cell phone or whatever. 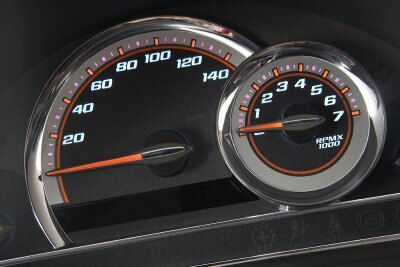 A boost gauge is mounted on the rather thick A pillar on the driver's side. My sample had the upgraded "Sun and Sound" Package, which included a nice (but very loud when open) sunroof that opens and closes with one touch, and a 6 disc CD changer/head unit that drives a 260 watt (a watt for each horsepower! ), seven speaker (with subwoofer) audio system that rocks. It also had XM satellite radio activated, which is always nice. Climate control includes air conditioning with a cabin air filtration system. The steering wheel tilts, is sized nicely and feels great in the hands; it also came with redundant audio (etc.) controls. Cruise control is standard, as is automatic headlight operation – a feature every vehicle should have. The driving position is very good, though the retro styling contributes to small windows and big pillars that can affect your view outwards. And the hand brake is placed a little far back on the center console for easy reach. The variable intermittent windshield wipers do a good job and the washer puts a nice, wide spray across the glass. There's also a rear wiper/washer. The interior is bereft of ceiling-mounted handles passengers can use to hang on in corners, which is a bit of an oversight in a car with a sporty mien. Windows and door locks are power (with remote locking via the key fob). The driver's is the only window to feature one touch retraction, and none of them feature auto-up. Both front sun visors vanity mirrors, but neither is illuminated. Safety equipment includes dual stage front airbags with passenger-sensing, and the usual bevy of belts, LATCHes (for child seats) and the like. Chevy says that HHR has received five-star crash ratings, which is the top ranking given by the National Highway Traffic Safety Administration's (NHTSA) New Car Assessment Program. I didn't expect to enjoy the HHR SS nearly as much as I did, but its combination of fun, comfort and utility make it a compelling choice in this market segment. The Chevrolet HHR SS Turbocharged starts at $24,565 U.S./$28,240 Canadian, which seems like a decent price for what you get.